Unique kitchen with a shine which is also handless. 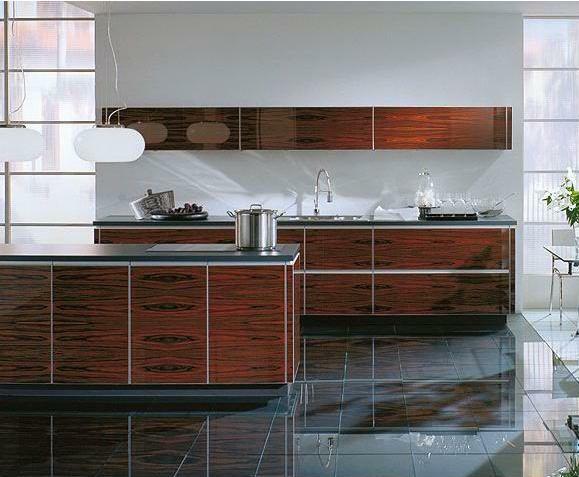 The high-gloss glass doors inlaid in real aluminium frames are imprinted on the back with a continuous wood grain. This kitchen design is an example of high gloss palisander, with a worktop of graphite finish. This is a perfect example of modern kitchen designs. This entry was posted on September 26, 2008 at 5:08 am and is filed under Kitchen, Kitchen design, modern kitchen. You can follow any responses to this entry through the RSS 2.0 feed. You can leave a response, or trackback from your own site.